chomski got bit ,partly his fault as he isnt very good at reading the signs and although he ran when told to he decided to stop to tell it not to be silly. the couple of puntures are not too bad,shallow and self cleaning but the rip on the front of his shoulder was about 4cm long and spread about 2 cm in the middle. as he seems to have greyhound rather than saluki skin stitching or staples would be a waste of time as the stitches would almost certainly tear out . anyway he was very good while i tidied him up and cut 5 large butterfly closures which seem to have held so far as the sticky bit is well attached to his fur especially with the micropore tape border to help it all stay on.fingers and hooves crossed he will leave it alone till the edges knit together otherwise it will be sore for a lot longer and leave a rather nasty scar. poor chap has been very brave as i know it must sting quite a bit. once ki saw him down she was on a mission to protect him which she did and fortunately as it ran she listened to me and abandoned her intended kill.she definitely had bad feelings towards the other mutt. the other folk seemed quite concerned we were going to demand vets fees etc etc but as a vet could not have done much that i haven�t done it seemed silly. as their one is a bit bitey when i see em again i will let em know there are no hard feelings but i will suggest a muzzle for off lead play same as he has to curb his overenthusiastic catch instincts. Ecch. Hope he leaves it alone overnight. I use this on my animals including the geese. It is for children, stops infection and speeds the healing process. Non sting, slow release iodine. It does work. Is there a UK equivalent? ta for the hint,there is a veterinary equivalent in the uk but i will check for that when i pop out for more sticky tape and melolin dressings.i normally use magic splosh but as that is oil based it makes it tricky to get adhesive butterflies and tape to stick to fur. so far so good ,he hasn�t tried to remove the dressing so fingers and hooves crossed the edges are still fairly well lined up. he squeaked a fair bit when he had to get up off the sofa to go for a wee at 3 am but he is tucked up again and seems sort of ok if rather subdued. he has had some veterinary canine nsai (fortunately i had some in stock post ki's dental work) to deal with any bruising and reduce any swelling and i will top that up this am along with some more valerian to help him stay still. as chomski seems to be sensible about such matters and is very cautious about moving around im hoping that i wont have to change the dressing for a few days and by then the edges will have knitted. i will use my nose (and other sensors) to monitor him for any signs of infection and get a vet to call if he needs antibiotics. hey ho ,mutt duties,poor chap. i managed to get the necessary supplies and have changed his dressing , he was very good about it. he is an excellent patient and my precautionary muzzle for the dressing change was really not needed. the butterflies had held it fairly close and although it has opened a bit the "slot" is only about 5 mm so hopefully the new dressing will stabilise it at that and he should heal up ok but he will have a rather noticeable scar. I hope the patient is doing OK.
it was between his legs near his castration scar and had gone uinnoticed for 24 hours and it healed really well. maybe try glue if you are faced with a tricky wound another time? i've had success using hair ties and glue on many a tricky child's head. superglue sticks skin far better than anything else I have tried it on. he does not have much length or density to his hair ,grey x smooth saluki. he has even less where i just removed his dressing to change it . the tear in his skin has opened a little in the middle but as it is starting to granulate at the edges and seems clean and healthy with almost no swelling and no necrotic skin. i just redressed it and hooves crossed nature will fill in the gap with some decent scar tissue..he has a smaller dressing now i know he is unlikely to try to remove it and the tear seems to have stabilised so it needs less compression. he was very brave and only wriggled once as i "waxed" his neck groove ,even warm damp micropore tape is a bit sticky on that sort of skin/fur. Badger dislocated one of his hind legs a few weeks ago....went back in but left a bump and he walked on three. I've been massaging each day and it has improved with him now using all four but gingerly. I massaged him whilst in the sea which he hates. Hope the hound stays quiet for you so that the wound can keep healing. massage and excercise while floating is ideal if you can persuade him that he is a water baby rather than a landlubber. i wonder if treats might help him enjoy his therapeutic dip? Only one of the five, Rap, loves the water. When he sleeps I think he dreams he is a Newfoundland. When I take the dogs in, Rap is always alongside and does help in reassuring. Sea baths help to keep down the ticks, never any on Rap. 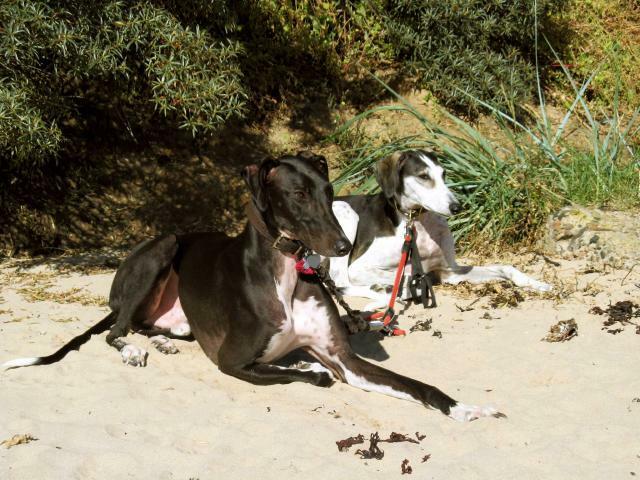 Last photos of your hounds they were on the beach....may be time for some more pictures!